Russian Roulette Beer Pong allows you to get super wasted real fast. It's like regular Russian Roulette, but instead of ending up dead, you'll end out passed out on the bathroom floor. 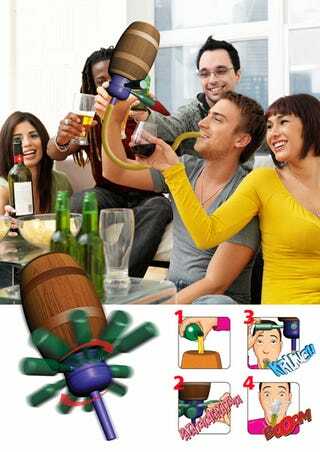 You fill the barrel up with beer and then spin the bottles underneath it. Remove the bottle it lands on, and if you're lucky, nothing will happen. If you're unlucky, a whopping two liters of beer will be unleashed through the tube and down your throat. Fun times?